Nabrico Hand Winches provide the extra hands you need for fast and sure tow make-up and breakdown. All hand models (except the 2T and 5T) are available in both right and left hand models. 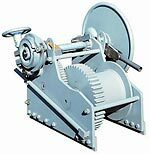 The Nabrico Hand Winches are available in 2, 5, 10, 20, 40, and 60 ton holding capacities. DF-156 S.T. LB. LB. IN. IN. IN. LB. MODEL 1/4" 5/16" 3/8" 7/16" 1/2" 5/8" 3/4" 7/8" 1" 1-1/8" 1-1/4" 1-1/2"
DF-156-10-6-M 1' 7-7/16" 9 13/16" 2' 1" 3' 0" 3' 4-3/4" 1' 9" 2' 7-1/8"
DF-156-20-7-M 2' 0-1/2" 14-1/2" 1' 11-15/16" 3' 0" 3' 3-5/16" 2' 6" 3' 1"
DF-156-40-11-M 2' 5-1/16" 1' 7-1/2" 2' 3-1/4" 3' 9" 3' 11-1/2" 3' 0" 3' 9-1/4"
DF-156-40-18-M 3' 0-1/4" 2' 2-1/2" 2' 3-1/4" 3' 9" 3' 11-1/2" 3' 0" 3' 9-1/4"
DF-156-60-11-M 2' 8-7/8' 1' 10-1/2" 2' 10-1/4" 4' 6-7/16" 4' 10-1/2" 3' 10-7/8" 2' 9-1/16"